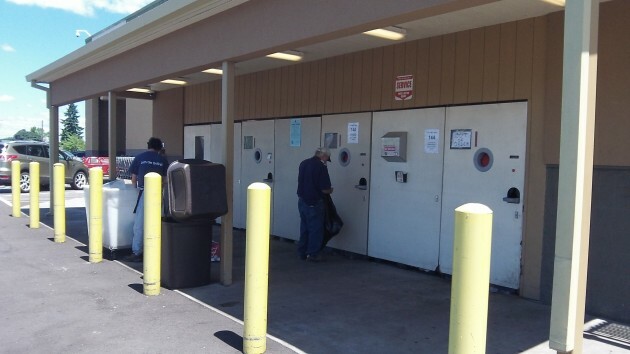 Two more retailers have decided to participate in the Albany bottle and can redemption center being planned by the Oregon Beverage Recycling Cooperative, says Cherilyn Bertges, the Portland-based cooperative’s public relations and outreach manager. “Safeway and Target will also be participants,” she wrote in an update she emailed today to a story that appeared here last week. “There was an amendment in the application request after it had been submitted. They both have OLCC signage at their stores now.” Six others were listed on the original application. The legislature authorized central bottle and can redemption centers several years ago in order to make the 1971 Oregon Bottle Bill work better. The idea was to relieve retailers of the chore of handling empties, a task getting bigger because lawmakers added to the types of containers covered by Oregon’s first-in-the-nation deposit law. When the Albany “BottleDrop” — the cooperative’s term for its redemption centers — opens, participating retailers plan to quit accepting empties. The others in Albany, besides Safeway and Target, are Fred Meyer, Bi-Mart, Costco, Mega Foods, Rite Aid, and Walmart. Makes one wonder why the OLCC is involved, especially since they don’t recycle liquor bottles? Because the legislation on redemption centers said the OLCC was in charge of reviewing them. Just like lawmakers piled the marijuana regulation on to the commission’s job. Well that makes sense. After all, legal monopolies always do such a fine job of doing those jobs that should be left to private companies. Want to ship a package reliably? Think fast, USPS, FEDEX, UPS. Hasso, I believe your reply was intended for your CARA story, not your bottledrop story. Nevertheless, I assume you have read Mr. Mikesell’s CARA application. He essentially admits that his project could be done privately with his money and a bank loan. But it appears he is not able to convince a bank to lend him $500k. He wants the building to be a “gem”, so to meet this expectation extra money is needed and that is where CARA enters the picture, and at 0% interest. Is this what CARA was designed to do? Fund “gems” at 0%? I say if private money can do an adequate job renovating an old building, public money should never even be considered to achieve “gem” status. CARA says Mikesell must put in a restaurant. We have enough restaurants downtown. What we should have is more retail.